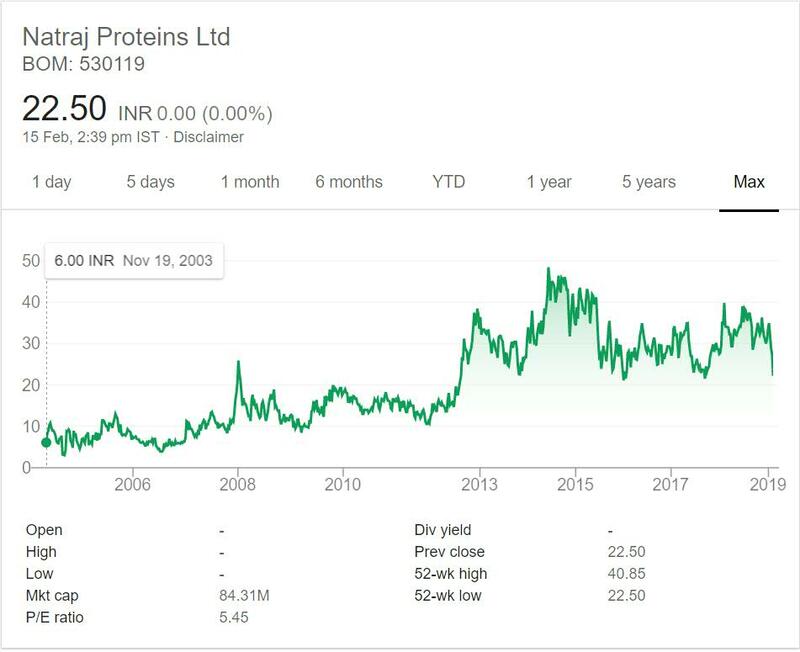 Natraj proteins Limited is in portfolio of Subramanian P. He is one of the top investors in India. The company belongs to Oil Solvent sector. As of now it does not have a website. I do not like a Company without online presence. This has become basic need in today’s world. However I tried to gather some information about the Company. The company set up a solvent extraction plant for processing soyabean, rapeseed, rapeseed oil cake, and other oil bearing substances. It sells refined Oil under the brand name Poustik. The company is very slow mover. If you see the long term chart it slowly moved upwards during these 14 year period. It has moved from 6 INR mark to 22 mark giving 3 times return to investors over the period of time. One thing is very interested it has never under performed in all these years. Having said that the returns are not worth the risk a investor takes investing in unknown companies. Natraj Proteins limited is in Oil Solvent and Extract sector. This is very interesting sector. It is growth sector. People are shifting towards Refined Oils.The consumption of Oil is not going to decrease in future. It will be on rise only. People have started to use more varieties of Oil. Earlier only Mustard Oil was popular. But now things have changed. Along with Mustard Oil people are using other Oils as well (Like Sun Flower Oil, Rice Bran Oil etc). I have not yet invested in this sector but it is on my radar. The sector is good but I did not like the Company. Problems are lack of online presence and clear information about business. The stock price has not performed that well to take risk on unknown company. I would advice to ignore this Company as of now. There are better opportunities available in market.